Did you know that one of my hidden talents is that of a mind reader? Let’s give it a shot. Right now you’re thinking, “Sarah, why are you torturing me with a COOKIE recipe? Don’t you know it’s JANUARY and I’m trying to be HEALTHY?” See? Told ya. OK, it may be true that this time of year people are trying to eat healthy. And I’m with you. But the thing is, if you’re anything like me, you also every-so-often want a little healthy but delicious treat! So, bookmark this recipe for when that hankering arises, because I’ve got the perfect healthy dessert for you! “How is that possible? !” your mind must be wondering. No grains? 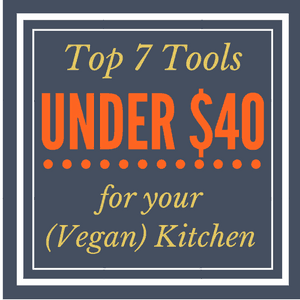 No eggs or dairy or other animal products? No gluten? No white or brown sugar? “Probably tastes like crap!” you might doubt. It’s OK. I understand why you might make that assumption, but I assure you that these cookies are deliciously moist, perfectly sweet and oh-so-soft. 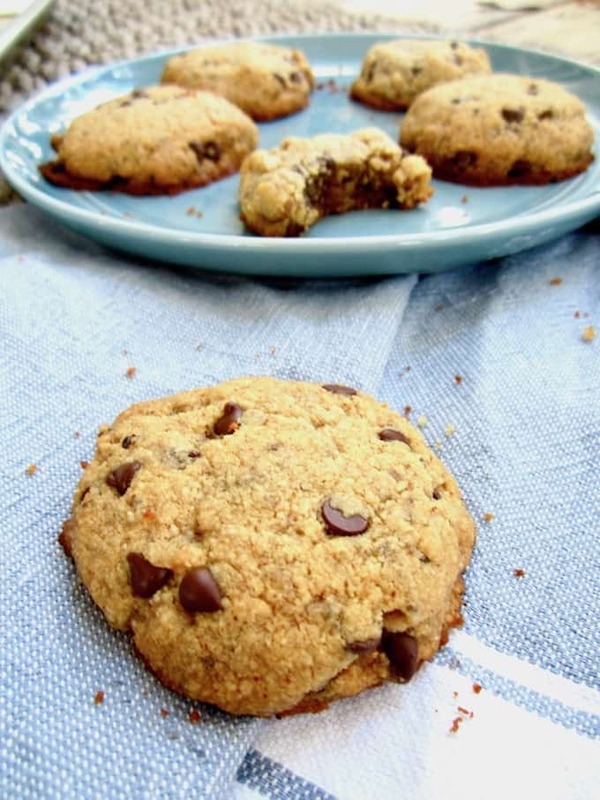 If you’re not a soft cookie fan and like them crunchy, then this recipe probably isn’t for you. 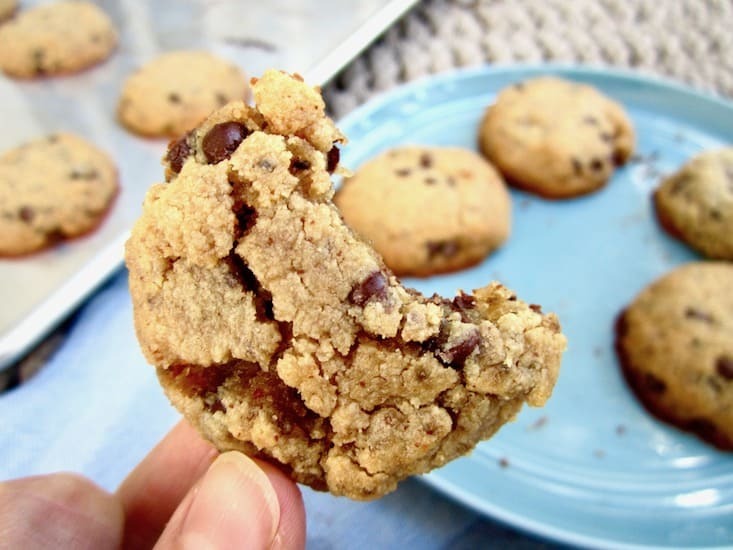 But all you avid soft chocolate chip cookie fans out there – you’re going to LOVE this recipe! If that’s you, you should also check out these soft Pumpkin Chocolate Chip Muffin Top Cookies + Coconut Frosting. Almond flour has so much flavor on it’s own compared to regular flour, meaning that less sweetener is needed. Really, the only sugars in here are the agave and chocolate chips (I used Enjoy Life Brand which is sweetened with evaporated cane juice), but the amount of sugar you’re getting per cookie is quite minimal since there is only 1/4 cup of agave and 1/3 cup of chocolate chips in the ENTIRE batch. 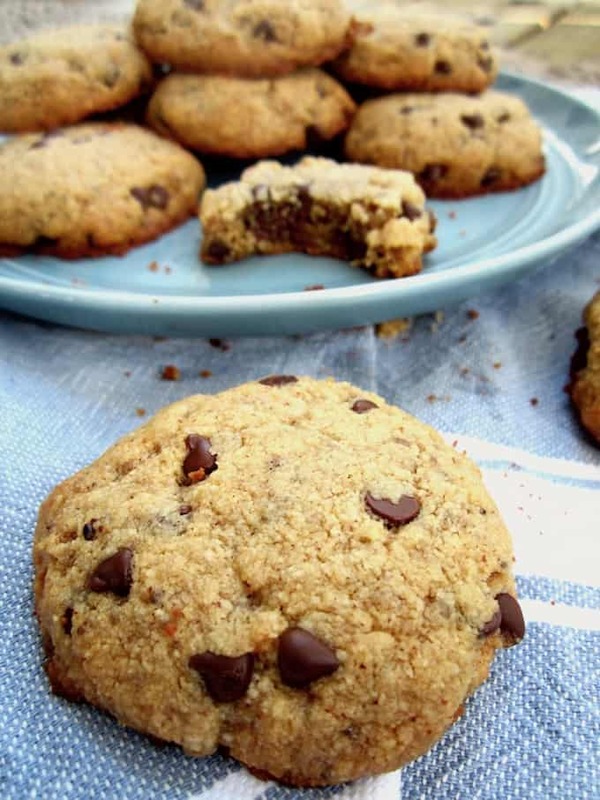 You could even substitute the chocolate chips for dried fruit and/or nuts and I bet that would be delicious as well if you’re looking for an even healthier option! 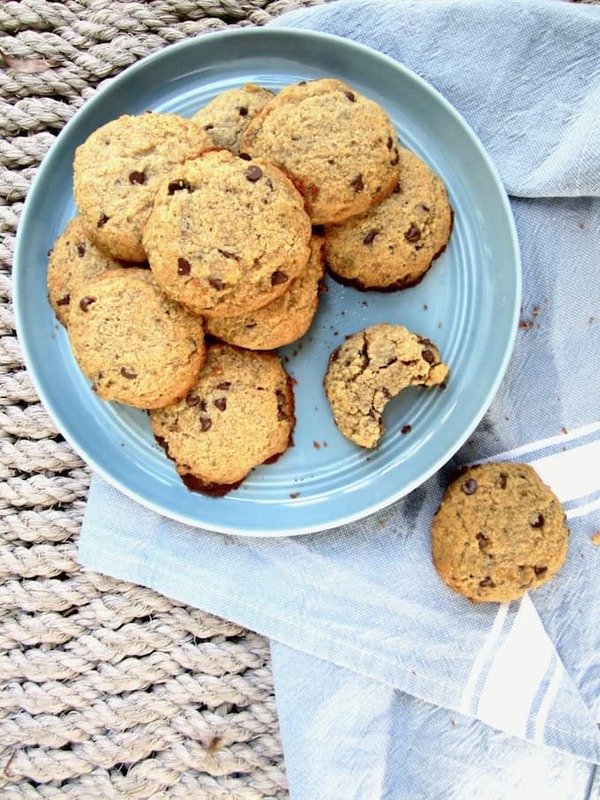 If it’s possible to have even more good news about these cookies, it’s that they even have a little protein at 2.7 grams of protein per cookie. Score! By the way, did you know that it’s ‘Veganuary‘ right now?! It’s a movement that supports people going vegan for the month of January. I’m a little late to the party but I think it’s really cool and wanted to share it with you! 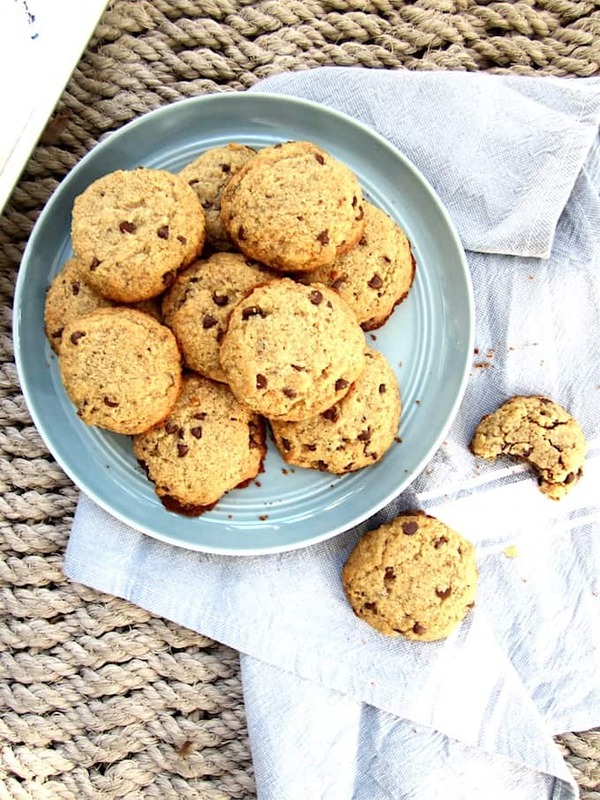 These cookies are gluten free, paleo, vegan AND refined sugar free - easy, simply delicious and made with healthy ingredients! Combine chia seeds and water. Place in refrigerator for 15 minutes to thicken. Add the dry ingredients in a bowl - almond flour, arrowroot or cornstarch, baking powder and sea salt. Mix to combine. In a separate bowl, thoroughly stir together the wet ingredients - vanilla, agave, almond butter and coconut oil. Slowly stir in the wet ingredients to the dry. Add the chia mixture and stir again. Finally, add the chocolate chips and stir. Refrigerate for 1 hour to allow the mixture to combine and oil to bind. On a greased or parchment lined baking sheet, or a silicone mat, use a spoon or ice cream scooper to place the cookies on the sheet. I like to lightly flatten out the tops of mine. Baked for 9 - 11 minutes. The bottoms will brown more than the tops. Mine were perfect once I saw the tops just starting to get color. Let cool on the baking sheet. They will be soft and firm up as they cool, so leave them alone (I know it's tempting not to!) and carefully remove from the sheet once cooled. Ooh those do look lovely, I'm a fan of soft cookies rather than rock hard biscuits. I haven't tried baking with almond flour before but these inspire me to give it a go!! They look awesome! I love baking with almond flour. It gives such lovely flavour. These cookies look AHHH-mazing. These are going on my LIST! I've been on the hunt for a vegan, refined sugar free, no wheat flour, recipe!! And um I had no idea january was "veganuary". That's sooo awesome.